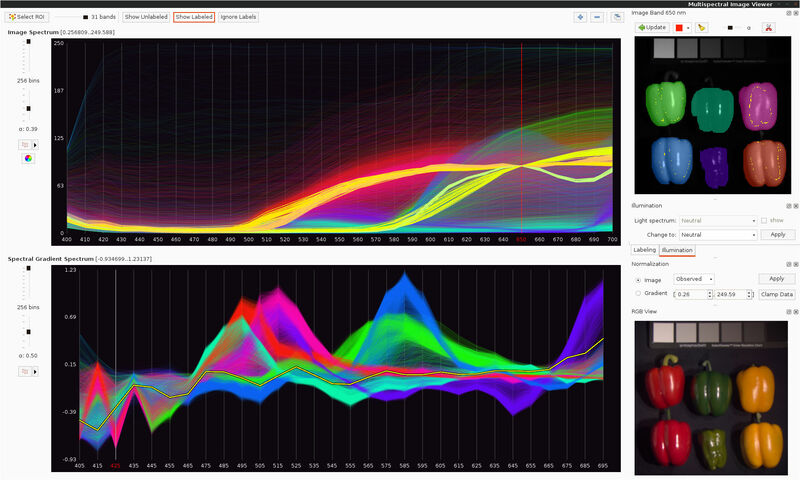 With the powerful interactive visualization techniques in the Gerbil software, you can finally explore the raw data of your multispectral/hyperspectral image in an intuitive way. Gerbil’s rich set of algorithms including feature space transformations, dimensionality reduction, segmentation and material clustering make it the first choice for many analysis tasks. See in the video below how a multispectral image can be visually explored in five minutes. Gerbil is free software and runs on all major platforms. For those curious about the concepts behind Gerbil and its underlying algorithms, we recommend the scientific article A Novel Framework for Interactive Visualization and Analysis of Hyperspectral Image Data. It is published open-access, which makes it freely available. Spanish speakers might also be interested in the student thesis Procesado de imágenes hiperespectrales by Esther Sánchez Bernabé, which gives directions about how to use the software. Note that I do not speak Spanish myself, so I cannot assess the document. Welcome to our new website which accompanies our move to Github for development. The new website design is responsive and also makes it easier for us to write new content. Gerbil development, including bug tracker and feature requests moved to Github (and the main source repository from SVN to Git as well). This means the development process is more accessible and interaction with the project is made more easy by using the tools Github provides, e.g. pull requests. We had a good experience with Github last year esp. with the work of our SOCIS student. Most of his work could directly incorporated into the software and will be part of the next release. See our Github project page with the new issue tracker. Once again (third year in a row!) we are mentoring students to work on exciting projects in a research-driven environment. Please have a look at our project ideas page and get in touch with us about your application! In version 1.0b we incorporate many new features as well as vast speed improvements and better usability! See the feature overview. Feel free to download the software or browse the source code repository! Get in contact with us and let us know how Gerbil works for you!